Ssxau200 milltek exhaust for seat leon cupra 2.0 tfsi 240ps 06> 11. This product sheet is originally written in English. Please find below an automatic translation into French. If you have questions please contact us. 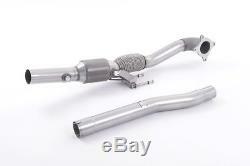 Ssxau200 milltek exhaust for seat leon cupra 2.0 tfsi 240ps 06> 11. Milltek exhaust for seat leon cupra 2.0 t fsi 240ps 2006> 2011 ride the downspout with hjs high speed sports cat. Type of system: mount the downspout with hjs high speed sports cat. Pipe diameter (mm): 76.2. Additional information: with hjs hq 200 cells high speed sports cat. For milltek sport equipment 2.75 "cat-back systems only. Requires a step 2 ecu remap. Navigation data: ships in 1 box measuring 130 x 40 x 30 and weighing 13kg. We will advise you immediately if the question remains available or not if you can proceed to your order. We will strive to publish stock items within 48-72hrs as far as possible, however delivery time will be extended if any item is not available. If you do not check the stock and an item is not available, we will assume that the item is required, continue your sale and notify by email when the item is delivered. Company history and other general information on milltek sport. Shoot over 34 years of continuous exhaust gas development and technical expertise to develop the ultimate sports-performance milltek range, which offers a comprehensive and ever-expanding selection of performance exhaust gases that build on the success of key brands like. Audi, Volkswagen, Porsche, BMW and Nissan. The milltek sport exhausts are produced in high quality type 304 stainless steel aircraft. This material is antimagnetic (stainless steel from other manufacturers may not be) and is less susceptible to discoloration. This quality of stainless steel is used on pipes and the total construction of the silencer. Bending mandrel ensures full flow, leans for better gas flow and milltek systems are increased in bore to ensure optimum performance without any loss of mid-range torque. All milltek exhausts are designed, developed and manufactured in-house in the UK. The vw / audi group (vag group). From our legendary 3 audi s4 bi-turbo system to our class leading audi r8 and ground vw breaking systems, milltek sport is the proven product of choice offering clear power, maneuverability and sound advantages over the competition. The spectacular success of the audi / volkswagen family of products being firmly established as sporting vehicles, drive milltek sport to build a wide range of products that cover golf gti models at the beginning by audi ur quattro to lactual audi rs3 and mk6 golf r Through milltek's network of sports distributors and tuning companies around the world, products are continually being created to deliver a 'hard edge' performance with discreet looks and sound. In the last 12 months, milltek sport have developed performance exhaust gas systems for many exciting new models, including the new audi a1, audi a5 / s5 sportback, audi r8 v10 gt, laudi rs3, the continental bentley gt / gtc, seat ibiza bocanegra, seat leon cupra r 265ps, vw polo gti and, of last porsche 997,2 turbo. Many of these vehicles had the unique milltek sport hi-flow catalyst and down to pipe assemblies developed for maximum back pressure reduction - developed and tested through close collaboration with the race teams of series such as the championship britsh passenger cars and the volkswagen racing cup. Models such as mini cooper and cooper are developed for global distribution, rigorously tested on the rolling road and through many miles of subjective analysis. Milltek sports look at an exhaust pipe style, ease of assembly, vehicle specifications and power differentials to deliver a range of quality, durable, and responsible product engineering to suit all environments. Recent additions to the lineup include the BMW 1m 130m coupe, mazda rx-8, mercedes sl55 amg, mercedes c63 amg, mini cooper s coupe and countryman cooper all4, sport rover range 3.0 tdv6 and, vauxhall corsa vxr nürburgring. Close cooperation with car manufacturers and dealers allows milltek sport to develop performance exhaust catalyst solutions and hi-flow right at the beginning of vehicle life. This means that the milltek sport product is available for you to buy as soon as you take delivery of your car. Milltek sport is led by car fanatics - our reputation has grown out of our continual quest for knowledge, backed by meticulous attention to detail. Milltek Sport will spend many hours testing and demonstrating our project vehicles for both our dealers and the public; Our enthusiastic driving style is designed to take our products to the very limit of durability so you can enjoy your milltek sport product for many years to come. Milltek Sport has links with a number of racing teams around the world (such as the British Touring Car Championship, Time Attack and Volkswagen Racing Cup), providing them with prototypes for testing under very demanding circumstances. Milltek Sport, a manufacturer accredited by ISO 9001 quality, have now acquired this type approval for a number of their products and will extend the approval program throughout 2013. All milltek sport products are covered by a limited warranty that applies only to the original purchaser of the product or parts only and is not transferable to a new owner. In this case, spare parts can be purchased at home or repairs can be made by an authorized milltek sport dealer. The owner of the product or parts will be responsible for all costs incurred as a result. Frequently Asked Questions about milltek sport exhausts. A selection of the more common questions we receive frequently asked for system mounting, performance data and cleaning tips. What kind of power gain can I expect to get? Each car has its own characteristics, and the power gain can vary considerably between them. 8-10% is the most accurate general figure to cover all variants. What does it mean when the pipe diameter, you say? Sizes of the pipes can vary from part to part. The diameter of the pipe we give is intended to be indicative of the system as a whole and does not necessarily mean that each part is of a uniform size. I want a sporty sound, but not one that is so loud that it wakes up neighbors or annoys me for a long trip. What sound do your systems produce? As our slogan indicates, "performance to blow your mind, not your ears! Our engineers' mission is to find the perfect balance between increasing maximum performance while maintaining a background noise level. We do not produce boy-racer style exhaust systems that can be heard on the miles. Our systems are designed to appeal to fans of all levels and the main way to control is by offering resonated and non-resonated versions of most of our systems - see below for more information on the differences between resonant and non-resonant resonated. What is a resonator and what is the difference between a resonator and a non-resonator? A resonator is a chamber in the exhaust system that contains a specific volume of air that aims to cancel certain sound frequencies (made by the engine) - making the exhaust noise quieter. Therefore, a non-resonated exhaust system will give you stronger performance and exhaust note and the resonant system will give you extra performance without increasing the exhaust sound a lot. Is it legal to cat my car? It is illegal to carve cars in the UK registered after 1993 it will not lead to a resignation check. What other solution do june de-cat have? A hi-flow cat will increase flow by as much as 30% over original manufacturers' unit. Can I buy parts individually (eg just buy the cat, or just the gutter or box)? Hi-flow cats are available as standalone purchases, otherwise the units are sold as back cat or back box only, because milltek are true performance systems you can not mix and match. Do I need to modify my vehicle to fit milltek products? Our products are a direct replacement for the original systems and equipped with everything needed to fit them. There are some vehicles that may require different rear valances to allow the exhaust outlets to exit the rear bumper eg. Setting up systems is very simple and can be done by any reasonably competent DIY mechanic. However, you can still get a quote from your local garage / milltek dealer for mounting. You can also download our Escape Mount Guide. My exhaust system is covered by a warranty or guarantee? As long as you are the original buyer, cat-back exhaust is covered by a warranty of manufacturing defects and corrosion protection and hi-flow sport catalysts and downspouts are covered by a 2-year or 80,000-kilometer warranty. We do not cover against any changes to our product, after it leaves our factory and not for unusual use of parts - for example, the use of nitrous oxide (nos), launch-control systems for spare parts, damage caused by going on a back of a donkey, etc. Our warranties are offered on the understanding that the power of the cars may have increased up to 33% over its original specifications but exclude incorrect modification. Changes made to increase power beyond this will void the warranty. We are proud of our after-sales support and customer service and will look at each case individually. All warranty cases must be handled by the milltek named distributor who sold you the system. Please note: milltek sport hi-flow sport catalysts are made from premium materials and built with maximum performance and longevity in mind. However, they are designed to work specifically in conjunction with other milltek sport products and should not be used on their own (with oem exhaust) or with other exhaust system manufacturers. If milltek catalysts are equipped with milltek-no exhaust systems, we are unable to provide any guarantee regarding noise quality, fit or warranty against their operation. How to clean my exhaust outlets in stainless steel without scratching or damaging? It is important to note that if you do not regularly clean your exhaust pipes (and we know some of you do not have :), they suffer from discoloration and will become harder to clean. Due to high quality stainless steel, you will always be able to bring them to new research (without any deterioration in materials), but the more you left without cleaning, it will be difficult! After several months of testing in all markets and weather conditions, we have launched our own adapted metal milltek sport varnish that will make any stainless steel exhaust system or metal component ready for contests or display duty, with the minimum of effort. Perfect not only to keep your milltek system in top condition, but also any other polished or chrome parts on your car or bike! To learn more about milltek Polish metal sport. Save on original equipment systems substantial weight. Precision, quality control manufactured to iso 9001 standards. Stainless steel of high quality aeronautical quality. Low pressure systems for maximum performance - without loss of low-end torque. Designed and manufactured in the UK. Many thanks for your interest. To pay for your merchandise, please use the debay payment. For more details on the delivery options we have and the costs please click here. For more details on our return policy please click here. Please do not hesitate to contact us to discuss anything you might have a question about. We are proud of quality service and we are happy to answer any concerns. Contact us via the mail system debay or. Add our shop to your favorites & receive the electronic newsletter on new items & special offers. The item "ssxau200 milltek exhaust for seat leon cupra 2.0 tfsi 240ps 0611" is on sale since Tuesday, March 14, 2017. It is in the category "auto, motorcycle parts, accessories \ tuning, styling \ exhausts \ complete exhausts". The seller is "mjd128" and is located in leatherhead. This item can be delivered anywhere in the world.